This is one of the popular snack from North-India. This ladoo is a classic snack item among Indian popular street food recipe. It is easy to prepare. 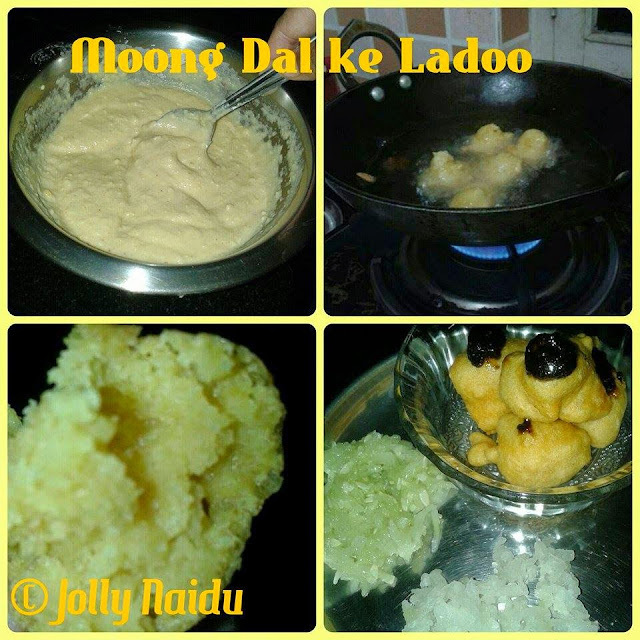 Learn how to make moong dal ke ladoo at home with step by step process. 1. Wash and soak the lentils (dal) separately overnight. Drain complete water of the lentils, and grind them into a coarse paste. Mix both the paste. 2. Using a hand beater or a spoon, add all dry ingredients like salt to taste, red chilli powder, turmeric powder, hing, garam masala, baking soda and beat the lentils till they become fluffy and light. Then now add besan and beat it again to become the batter fluffy and light in weight. 3. Heat oil in a kadai / wok, temperature of the oil should not be very hot or cold. The flame should be on medium heat. Using hands form small balls of the paste and put them in oil simultaneously. 4. Fry them slowly on medium heat till they turn golden in color. Place them on an absorbent paper. 5. Repeat the process in making 15-20 Ladoos. When to serve, heat oil again on high flame and fry the ladoos again for making them more crispy for 2-3 minutes. 6. Serve the ladoos and garnished with green or tamarind Chutney, chat masala, grated radish and cucumber!!! One can also add chopped green chilies and grated ginger to the paste for enhancing the taste. Do not fry the lentil balls too much otherwise they will become very hard. They taste best when served hot and crispy.